"You really love something? To show up is to put yourself out there, to accept vulnerability and choose courage. Some days can feel like magic. As runners, all we do in training and racing is to prepare for those great moments, to help them come more frequently, and so they are ours to embrace when they happen". Wow…what a year it has been. I've had a lot of ups and downs this year, but through it all, I still have a lot to thank God for. Even though 2015 brought me four PRs in the 3K, 5K, 10K and a half-marathon, I’ve realized that the journey isn't always pretty. It isn't always comfortable. Sometimes it hurts. It can even break your heart. This year I've had some setbacks as some of my races didn’t go as planned. Some of my race times were disappointing to me, and it was heartbreaking. At times, I've felt that even though I'd work my hardest my hard work wouldn't pay off. During these times, I had to remind myself to enjoy the process of running rather than just putting my focus on chasing times. I was so happy to win the Shamrock Half-Marathon with a 2 minute PR in March. This one was one of the rare moments this year when I actually felt great during a race, I felt joyful, and I tried to soak up every moment racing in the cool Virginia Beach weather. I felt like things were falling into place, and I was looking forward to racing Grandma’s marathon a couple months later. 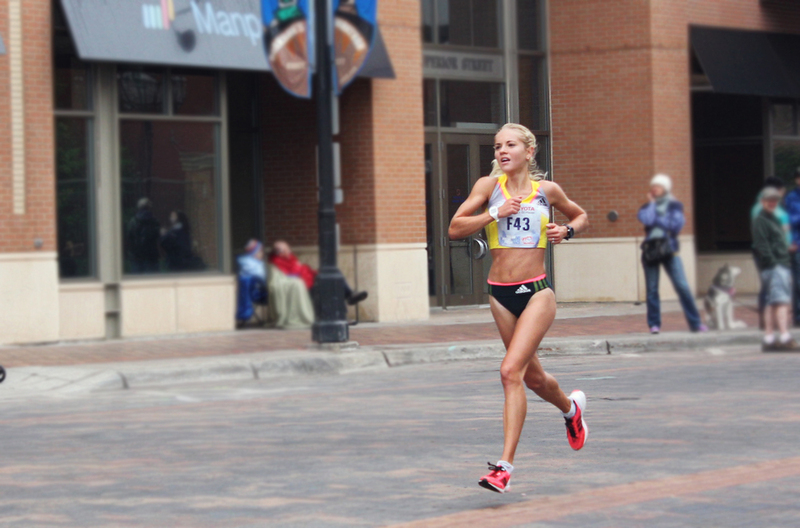 When I arrived in Minnesota, I felt my achilles tendon flare up during my shake-out run a day before the race. I ignored the pain. I’d been having this injury for a month prior to that, but I was hoping that it would not sabotage my race. Well, I was wrong. The race wasn’t pretty at all, and I finished 3.5 minutes off my PR. After the race, my foot was burning with pain. I was crushed that the marathon didn’t go as planned. I was really hard on myself. After the injury, I took over a month off from running, but I had a blast discovering new and different ways to cross-train. I started slowly getting back in shape and this time I craved trails. So, I started doing most of my runs on jungle Hawaiian trails which helped my tendon to heal quicker. Training in the woods brought me a new passion for running. Two months later, I signed up for XTERRA Trail Gunstock Half-Marathon and won the race. It was a tough one! Upon crossing the finish line, I was pooped. But, I had a feeling of awe that I’d just conquered an epic course. One that had taken me up and down through mud patches, rock piles, fresh cornfields, single-tracks, and streams. It was so amazing, and it felt so good to be back! My next race was the Philly Half-Marathon, and I expected nothing but great results from the flat course in downtown Philadelphia. Three weeks before the race, I got terribly sick. Chills. Cough and fever. I can't recall the last time I'd been that sick. It forced me to take two weeks off from training. I started feeling better 12 days before the race, so I made the decision to not cancel my race hoping that I could bounce back and still maybe not run a PR but at least have a solid performance. Unfortunately, I didn’t feel strong on that day and I struggled to stay on pace during the second part of the race. Oh, well. I was disappointed, but I knew there would be a next time. Nothing motivates me more like missing my goal. After I recovered-both physically and mentally, I dove right into training again to get ready for XTERRA Trail World Championship 21K. On race day my main goal was to run with joy. Even though 2015 was a great year for me and I’d had many breakthrough races and big PRs, as my times got faster, I thought I needed to work even harder to achieve all the running goals that I’d set for myself. Instead of joy and feelings of appreciation, my training turned into pressure to hit the marks and the expectations that I put on myself. In the process of that I felt like worry started forming a big cloud around my training and racing slowly replacing my joy for running. 2015 had a lot of ups and downs, and yet, it was so beautiful as I feel like my past experiences have strengthened my faith. I know that God has already been blessing me so much, so the last race of the season in December 2015 my goal for the day was...to just enjoy it and remind myself why I started running in the first place. XTERRA Trail World Championship 21K is a tough hilly race with gorgeous scenery. My main goal to "run happy" was accomplished as every time negative thoughts would creep up I found something to be joyful about even during the most challenging parts of the race. I had an amazing time scooping the trails at the XTERRA Worlds. Honestly, even though I finished 2nd overall, I feel like my joy for running is back. There is nothing more exciting than bouncing back from a disappointing race and experiencing success at the next one. As for now, I’m taking a break from running and trying to hold the horses (and not search for a next upcoming race). I am also very excited for the 2016 year. It's going to be good. I just know it. Not that I'm wishing for any year to just pass already, I am just sure there are some good things on the horizon. It won't be any easier, I already know that, but 2015 feels like it has been the year of on-going lessons, really hard ones. It has also been the year where it felt like I grew the most in a long time. That said, I am ready to see what 2016 has in store for me! I'm thankful for my family, friends and sponsors. You all make what I do possible! Cheers! I've realized that an important part of being an elite athlete is to develop the ability to make peace with setbacks, and to not let a bad race or a workout define you. When everything seems to go perfect before a race, and the mind is ready to do whatever it takes to win or run a PR, sometimes, the body may just refuse to cooperate. This past weekend I competed at the Mt. Sac Relays in the 5K. I had a clear race strategy and anticipated a huge PR based on my workouts leading up to the meet. After a slow first mile, my body shut down for no apparent reason and the more I pushed the worse it got. I started blacking out and struggled to take in oxygen. My prayer was just to be able to keep moving and cross the finish line. Never before had this happened to me and I was surprised and shocked afterwards as the emergency medical team evaluated me. Disappointment tried to swamp me, until I was finally able to accept the unexpected and find peace. I now know that experiences like this are a part of being an elite athlete, and I'm so extremely thankful for a wonderful husband and medical team who were there taking care of me afterwards. So many things to be grateful for: I have no serious injuries, and I believe that I will come back stronger and hungrier. I’ve realized that running setbacks can really help keep things in perspective. Now I will truly cherish every PR and victory, knowing that they do not happen every race. I've been a runner for only a few years, so I haven't experienced many ups and downs in my career. But, now I won’t fear "running slumps" or “setbacks” for I am certain they will give me chances to become more resilient and wiser as they become an integral part of the process of success. As for now, I'm going to take a break from running and get healthy, so I can come back stronger than ever before and continue using my God given talent while doing something that I really love! Here it is. End of the best yet racing season. It has been a wild journey: long runs, short runs, good runs, bad runs, rainy runs, hot runs, cold runs, muddy trails, pool-runs, 24 milers, dog-runs, speed workouts, tempo runs, great days, 9-minute days, PRs and tears from joy after crossing the finish lines! What an amazing feeling it is knowing that you’ve done your very best! And now with my last marathon behind me, I'm looking forward to holiday festivities filled with Christmas music, family, hot cocoa and ZERO running for at least a week! The 2014 training/racing season was truly amazing and taught me so much. I’ve learned how to be patient, believe in myself but set realistic goals, trust God no matter what and not to replace my meals with a bar of milk chocolate! California International Marathon was a humbling, but still an incredible race experience. Even though I didn’t feel my best from the start, I learned how not to let negative thoughts settle in my head. When my legs started giving up on me, all I could do was pray and ask God for strength. “Be strong and courageous. God will not leave you or forsake you” Deuteronomy 31:6. After getting the “A” standard on the rolling Sacramento course I feel so full of hope and extremely enthusiastic to keep running, keep improving! It has been a very successful and joyful season of lots of miles, 4:30 am’s and travelling. I couldn’t ask for more. I love my lifestyle, because for me running it is not just about winning or losing, but it's about truly enjoying every part of what I do on a daily basis. Even though I know I am still far from reaching my full potential, I'm not setting limits, and I’m grateful for God's provisions and the many opportunities given me. So with this year's marathon racing behind me, I’m ready to vault into the 2015 spring season with positive pants on! Huge thanks to my sponsors: Hawaiian Ola, Bioastin and Lanikai Juice for their generosity and support! Finally, I got to sit down and go through the pictures from our EPIC trip to Japan. The huge amount of pictures I took perfectly reflects the amount of fun, yet crazy adventures that Nate and I had while travelling and exploring Japan. I must reveal my secret by saying that I have been a big fan of Japanese culture since I was a kid. Watching anime, listening to J-Pop were some of my favorite things to do; Five years ago I started learning Japanese and now my home is Hawaii where I’m surrounded by Japanese speaking people. Whoaa! What a coincidence! When we first arrived in Tokyo, I was a little overwhelmed. People. Tons of people...all in black suits were filling the metro station. Tokyo train stations are known for their massive crowds. We made it to the hotel and headed for a run next morning. The weather was perfect! Crispy and chilly. I finally got to unpack my warm outfits which are useless in Hawaii. On a run, we saw lots of tall buildings and Starbuck coffee shops which seemed to spring up like mushrooms after the rain in Japan. You can see Starbucks almost on every corner. We got to visit one and enjoy a tiny but extremely cute sized cup of coffee. Yes, it’s true, portions in Japan are much smaller than in the US, so Nate and I had to hold off our wolf appetites until we returned back to Hawaii. I was very stoked about my upcoming Half-Marathon which was 4 hours away from Tokyo in the city of Ichinoseki. Nate was also running the 10K, and as he said after finishing the race, it was the most competitive 10K he had ever done. I was also pleased with my two-minute half-marathon PR, and after the race I was happy to meet the best runners in Japan, Eri Okubo and John Maina. After the race, we were taken on a super peaceful and slow canoe ride where we saw some beautiful nature and got to feed giant lake koi fish. Two days later, we arrived back in Tokyo for sightseeing, running, shopping and trying local food of course! We got to explore two of the busiest stations in Tokyo. I was blown away by all the colors, people, stores, and lights. So many things to see and to do that at first I thought my brain was going to explode from all the excitement! We decided to embrace the Tokyo spirit and play some video games at a huge six-store "Sega" building. Video games and slot machines are extremely popular here, not only for teenagers, but also for older people. We saw a couple of old ladies having a kick playing video games...something you won’t see in the US! On our exploring walk around Tokyo we also noticed some strange but epic food choices: black burger, jellyfish ice-cream and tons and tons of sushi, of course. I never thought I would enjoy eating raw sushi for breakfast! We stayed in one of the tallest buildings in Tokyo close by a tower, which reminded me of the Eiffel Tower in Paris. It’s a very tall and visible tower, so every morning on my runs I could see the tower from far away and could navigate myself without getting lost. After leaving Tokyo, we took a train to the mountains where we stayed for two days. Unfortunately, it was cloudy and we couldn't see Mt. Fiji, but we got to walk along a short trail from the Owakudani ropeway station to the volcanic zone, with sights of steam vents and a big sulfur pond. The smell of rotten eggs filled the air and wasn’t pleasant, but most of the tourists for some reason were trilled about eating blackened eggs for lunch! The next day after a hilly 12-mile run, we headed to Kyoto. Kyoto has always been my dream destination, and the city was even better that I expected. Cold, thin air, clean wide roads, beautiful gardens, temples, and stellar places for longer runs. In Kyoto we visited a Sagano Bamboo Forest and explored it for awhile, amazed by the size of the bamboo. It was a long but super eventful day. Next stop: Osaka! We stayed in the tallest hotel in Japan which had an amazing view of the whole city. We found a local Tokoyaki bar which is a place where they serve an octopus ball snack that I absolutely love. It thrilled me to see Nate giving it a try. He wasn’t a big fan of the local Japanese snack, but oh well…trying new things is a big part of the travelling experience. On our last day in Osaka, we didn’t have anything planned. So, we just took a walk enjoying our last few hours in the city. Looking back at the whole Japan experience really bolstered my faith in the human spirit as, even in a different country far away from home, I was able to experience the support and encouragement of other runners. This is one of the reasons why I enjoy being in this sport so much...Runners help each other and set each other up for success. Running is selfless, and I’m happy to glorify God through it. A huge thanks to my crew: Nate Carlson, Lanikai Juice, Hawaiian Ola, ITakeBioastin, Runner’s Route and EPIC bars. I am so blessed to have such a supportive team surrounding me and my endeavors. Eleven hours in the sky. Three hours on the road...to then embrace a five hour time difference: Yes, travelling from Hawaii to Duluth, Minnesota was a long and tedious trip. But, Grandma's Marathon, one of the fastest and most elite marathons in the U.S., is held here, and I've arrived to race! Had I know back when I decided to add it to my competition itinerary that it would become one of the greatest racing experiences of my life...Well, all my final pre-race workouts have been super-turbo-charged with excitement! Arriving in Duluth, the temperature change slammed into us as we stepped off the plane. This was summer? I was glad that gloves, hats and thick sweaters were snuggly packed in our suitcases. I'd anticipated the weather...thinking it would be chilly. So, 45 degrees?! I think I can handle it. Feels like a good temperature for racing fast! We drove from Minneapolis to Duluth to meet our host family. Their beautiful home was nestled in a quite community. Every year they host elite runners and love it. They were so incredibly helpful and welcoming. 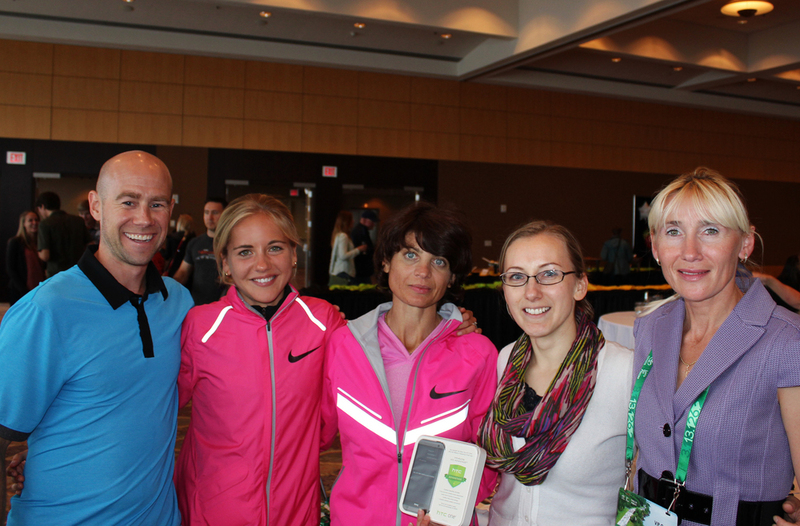 Next morning, we picked up my race packet and had a lunch reception with other elite runners. The lunch was amazing and healthy, too. After the main course, I couldn't resist eating two delicious cake bars. Carbo-loading the day before a marathon is one of my favorite pre-race routines! That same afternoon, we drove the race course. Studying the serenity of the scenery and seeing the beauty of the city and the lake I'd be running alongside, gave me confidence and got me excited for the following morning. My husband, who is also my coach, truly believed that I would be able to get the Olympic Trials Marathon qualifying time. His support and encouragement, along with that of my friends and family who also believe in me, helped give me courage and peace for the upcoming challenge. When the gun went off, I was full of joy and for the first part of the race, I couldn't stop smiling. I was running a little faster than my goal race pace, but I felt very relaxed and simply happy to race. Then, as the weather temperature started dropping, I could barely feel my fingers. I couldn't grab anything to drink with frozen hands. I ran with a pack of guys in a steady even pace, clicking 5:58-6:03 per mile. 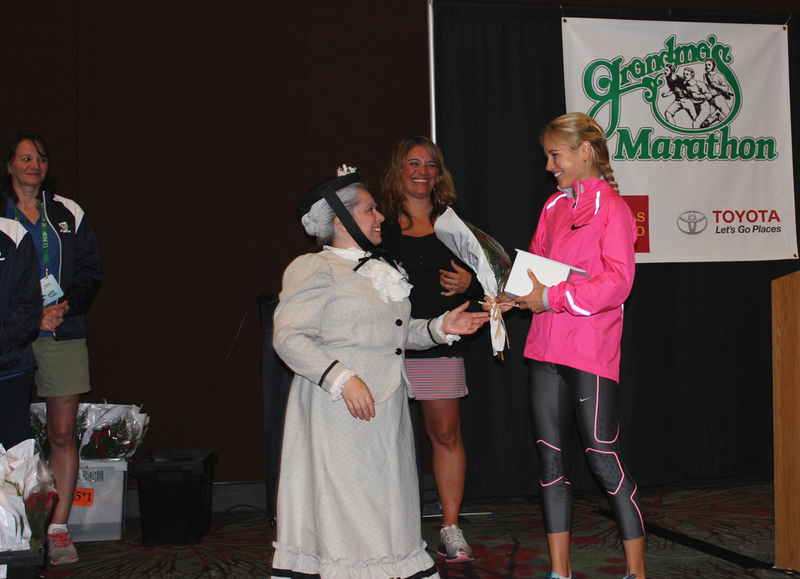 The fan support, volunteers, the cheer music: so many things were incredible about Grandma's Marathon, and it kept me going. I loved seeing Nate cheering for me at mile 16. He was yelling and jumping in place! I smiled back and enthusiastically waved to him. At mile 22, I saw many people cheering on both sides, shouting encouraging phrases and one of my favorite songs was playing. That's the moment I got goose bumps and my second wind. The finish line was SO close! I prayed to stay strong and finish the last two miles hard. God gave me strength to do that, and I ended up finishing with time of 2:38:15 - an Olympic Trials Marathon qualifying time. I also came close to meeting the 'A' standard, which is now my future goal. Looking back, even five years ago, I never imagined that I would ever compete in any other sport besides tennis. When I started running for "fun" at the University of West Alabama and then later, representing Hawaii Pacific University in cross-country, I didn't know where running would take me. But, I did know that God had good plans for me. A month after finishing my last cross-country season in college, I ran my first marathon and it was love from that moment on! Now, I'm an Olympic marathon trial qualifier, and I know it's just a beginning. I believe that nothing is impossible; I feel that I'm doing exactly what I'm meant to do and that I'm exactly where I'm supposed to be. So, I'm "running" forward...to see where I go!